A co-worker was telling me about this amazing quinoa granola recipe she recently made and passed along the recipe to me. I made it that very weekend and was thrilled with the results. Much like my steel-cut oats granola, this quinoa version has lots of texture to it, and such great nutty, toasty flavours from the quinoa and sesame seeds. It's chock-full of goodness, from nuts, to seeds, to dried fruits. Like any granola recipe, this is very versatile. Just swap in things that you like for things you don't to personalize the granola mix to your own tastes. I'm thinking of trying this recipe with some cocoa powder mixed in next time for a chocolaty version! Preheat the oven to 225˚F. Measure the oats, almonds, pumpkin seeds, sunflower seeds, sesame seeds, quinoa, coconut, walnuts, cinnamon, nutmeg, and salt into a large bowl. Mix well. Add the maple syrup and vanilla extract to the oat mixture and stir until evenly distributed. Spread the granola evenly on a large baking sheet and bake for 1 hour. Remove and set aside to cool. 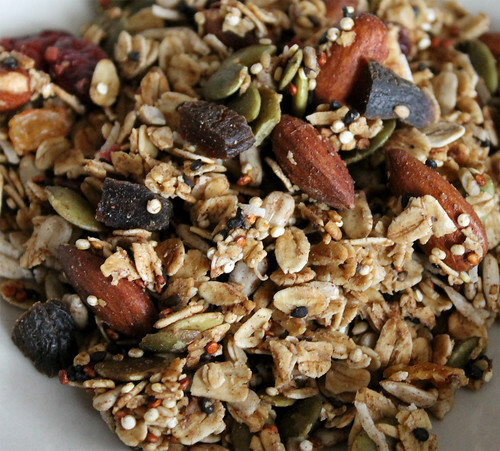 Crumble the granola into a large bowl or container. Toss in the cranberries, raisins, and apricots. 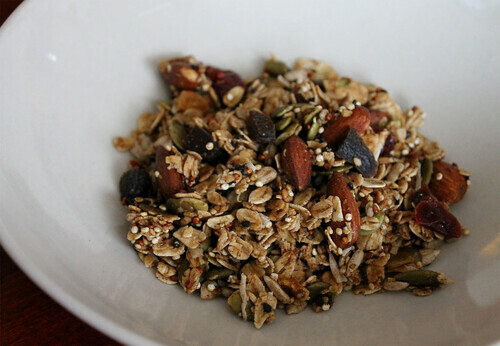 Store the granola in an airtight container for up to 4 weeks. * I used a half-half mix of white sesame and black sesame seeds. If you want an even nuttier flavour in your granola, lightly toast the seeds first. ** I used a half-half mix of white and red quinoa. Ally January 30, 2012 at 1:32 p.m.
Nice one! I've heard about a quinoa-granola recipe before but have always been hesitant to try it...this might change my mind though!